You can find the first and second snippets here: Farmhand. This is my sweet Western Romance novella, with elements of adventure, family, and working hard under the sun. I hope you enjoy it, and the new cover. It will be released soon, I plan to announce that on November 7th! I had an amusing moment this last week as I was reading an old favorite that I haven’t revisited in years. Louis L’Amour’s Shalako was evidently an unconscious influence as I wrote the original short story Farmhand grew out of. There’s a woman named Irina in that book, too. Irina walked back to the bunkhouse, the solitary sodium light casting a yellow glow over the driveway and basketball hoop. The net was long gone, but she could easily imagine her new – well, he really wasn’t her employer, and she’d definitely caught the undercurrent he wasn’t happy she was a she – coworker? That didn’t feel right, either. Especially not when she was imagining him without a shirt, playing and laughing. He was the kind of man she wished she’d had, before… She opened the door of the bunkhouse and shut it firmly behind her, banishing fantasy and musing on being alone. It was refreshing, this. Her time in the service had been uncomfortable, at first, with people around her constantly. She felt her lips quirk as she remembered the group of young female recruits, her a mere year older than most, but ages beyond in confidence. They’d been herded into the bathrooms, ordered to shower and be out in ten minutes… and the whole group had broken into dismayed outcries. Irina had pushed her way impatiently through the clot of blondies, as she’d already dubbed them, ignoring not only her own hair color, but their individual hues. Irina hadn’t said another word, just stripped efficiently and stepped in. The others had followed reluctantly, but they were all more or less clean when the water had been turned off promptly at the five minute mark. So she’d gotten used to constant chatter, people in her room, later on, just a roommate. Then the bliss of off-campus housing, with only a new husband in it. When that soured… Irina shunted that memory aside, skipping forward to a few days ago, sitting in her CO’s office. Irina had known it wasn’t good news. There was no good news since her disastrous return from deployment two months before. The aftermath of that had been weeks in the hospital, two surgeries, and a lingering concern. She’d rapped on the door, and he looked up from the pile of paperwork. “Sorry, sir.” Irina felt her heart sinking. She could feel the trembling start, and breathed deeply, trying to control it. She refused to allow it to control her. She’d nodded, unable to speak. Irina had gulped. She’d known this would happen, what had happened with her life, the screw-ups she’d made, it meant the end of her career. And she had nothing, outside the Army. No family, her friends were here, or in other units scattered around the world. Irina had walked out of his office, gone back to her room in temporary quarters, where the papers were waiting for her. Less than 24 hours later she had been on the road in a rental car. She didn’t remember much of that first day, she was pretty numb. That night she’d found a cheap hotel and did some shopping. Sitting cross-legged on the bed with a map, she’d made a plan. Money wasn’t really a big deal for awhile yet. She didn’t have anyplace to go. She couldn’t go far, either, she’d been warned that she should be able to respond in 24 hours when the trial came up on the docket. She was deliberately not thinking about that. With a pencil, she drew a rough circle around the base, and then looked for a place with no cities. Maybe somewhere with horses, blue hills, and empty sky. The next morning, she set out to find something she only faintly remembered. What she got was an old man, a mess of hay, and a job. What had she been thinking, that she was going to play cowgirl? Well, why not. She liked Gray a lot, and Dev? He was easy on the eyes. But she was going to keep her distance. 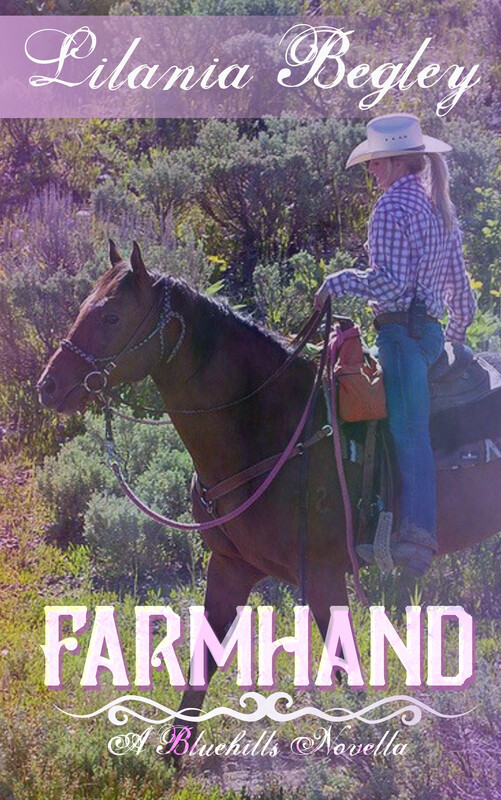 Tags: Farmhand, Irina, LÁmour, lilania begley, western romance. Bookmark the permalink. I like this cover picture, but her leg looks funny for some reason. I don’t know if it’s the angle or what? I’ll re-read the story this evening — looking forward to seeing what you did with Irina! Yes, someone else commented on this. Her leg is fully extended, like she’s about to stand up in the saddle. Maybe that’s where I should put the text blurb, to hide her knee!